Looky what I found! Good ole Google digging never lets me down. I reckon I go deep sea Google diving about once every two weeks and I always find something that is new to me on the Fassy boy. And what nice treasures eh? A wonderful candid photo of Michael behind the scenes of ‘Creek’ with the makeup artist folk. As per the subtitle of the image at Ken Niederbaumer's website under the ‘celebrity’ link, page 1, it says ‘Wirth’ and that is the character name of Michael in the whenever-to-be-released-sometime-this-year ‘Creek’. 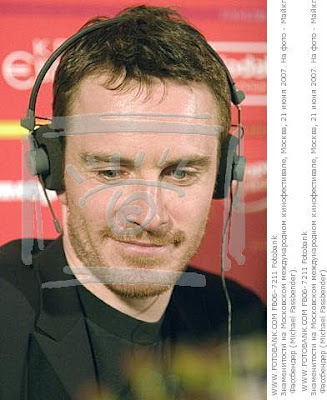 And, I found two newer images from an interview back in 2006, I believe, at a Russian website. These look familiar, but the coloring and angle of the photos gave me pause and there’s just something ‘fresh’ about them and warranted my bringing them to your attention. Hope you enjoy these bits as much as I do. As the Cannes Film Festival will commence next week, ‘Fish Tank’ is getting more media bites, but still no images from the film featuring Michael. It’s a modern day piece and I’m very anxious to see what he looks like. I just love his clean cut pretty boy look, but if he’s got something ‘ethereal’ about him in Fish Tank, as the film synopsis alludes too, I bet he’s really looking hot. We’ll soon find out for sure. 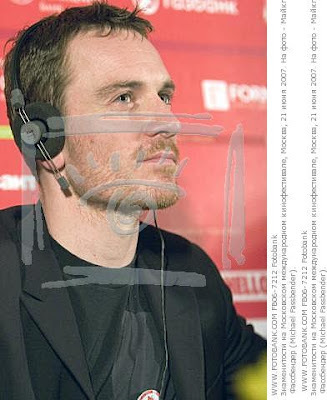 Hey, I notice that Fassinating Fassbender get a lot of hits on some days and I appreciate that very much, but none of those visitors post, and that’s ok too. However, I was just wondering if any of those visitors could spare a moment to answer a question or two or three, because you never know what they know. I have just these few questions that I would appreciate anyone answering if they know the answers, and you can post anonymously. 1. What is Michael’s middle name? 2. Is there a transcript of Michael’s acceptance speech at the Irish Film & Television Awards from February? 3. His American agency is the William Morris Agency, but what is the name of his specific agent? Thanks in advance if anyone can provide the correct answers to these questions. Oh, and a couple of weeks ago I created a new thread at the Empire Online forums because, believe it or not, they did NOT have a thread about Michael in the Actors and Auteurs (Praise your Idol) forum. So, I created one (http://www.empireonline.com/forum/tm.asp?m=2335247) and posted a few images. Then a few other people added their two pence. The comments of one poster attracted my attention, so I pm’d him to get more general information. Basically this guy told me that he met Michael a few years ago in Killarney outside a ‘chipper’ on Halloween. This guy’s mate introduced him to Michael who was dressed up as a cowboy. Michael was trying to keep a low profile, but he came across as very nice, even though he was totally drunk as was everyone else that evening. Cool story… just one of those nonchalant story telling gems about Michael or any celebrity you may admire hearing from a person without an agenda. You are just full of good info today!! Soem day we may actaully get to see Creek! lol And I agree those shots from the Russia film festival are defintely new! I love those little stories about Michael! Thanks Tina, glad you enjoyed the 'new' info from this post. If it's new to you, then it's new to a lot of people. :) I figured those Russian photos were new, I hate watermarks, but we see enough of Michael's beauty. And yeap, I love those first hand fun stories about Michael too. 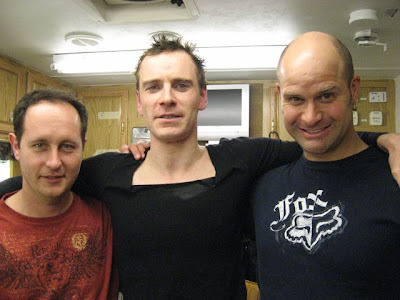 Is Michael Fassbender the same as the Michael T. Fassbender who is credited in the Lord Of The Rings? If so, what character does he play? No, Michael has no credits in the LOTR films. That is a different Michael. Attention all MF fans!!! If you're a true fan of MF, please tell the Academy that hosts the Oscars you're horribly disappointed that they refused to recognize him in this year's Oscar's nominations. You can give them your comment at their website listed below. Please do. It's a travesty that the Academy is not recognizing true acting performance.